In the years leading up to Sri Lanka’s ill-fated 2009 Test tour, Pakistan had experienced several incidents which led to international matches being abandoned or cancelled. Sri Lanka was playing as a replacement for the Indian team, which had pulled out after the Mumbai terrorist attacks; they had been promised ‘presidential style’ security. 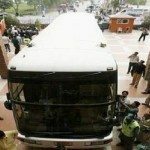 On the morning of March 3, the vehicles transporting the team to Lahore’s Qadhafi Stadium for day three of the second Test were attacked at Liberty Square roundabout. Masked gunmen opened fire on both the coach carrying the players and the minibus in which the referee and umpires were travelling. It was only fortunate that the grenades and rockets loosed by the assailants were ineffectual, else the carnage would have been far worse. Even so several players suffered shrapnel wounds and the driver of the minibus was killed, although none of his passengers was seriously injured. The coach driver courageously drove on through the hail of bullets to the safety of the stadium. A policeman who had boarded the minibus seeking cover had to be urged to take its wheel and follow the coach, which eventually he did. The match was abandoned as a draw and the team was airlifted from the stadium and flown home. Those blamed for the outrage included al-Qaeda, Lashkar-e-Taiba (‘Army of the Pure’ – an outlawed militant group which had issued a fatwa against playing cricket) and the Tamil Tigers. The world was appalled by the attack, the first on a national sports team since the Munich massacre of Israeli athletes in 1972, and there was universal condemnation of the lax security. Footage from CCTV cameras had captured the whole scene: it not only showed the masked gunmen arriving, making their attack and escaping unchallenged but also recorded security forces running away. What was the Attack on the Sri Lankan Cricket Team death toll: Eight – six policemen, the minibus driver and a civilian were killed. You should know: Police involved in the attack were later awarded medals for velour. Coach driver Mahar Mohammad Khalil was widely hailed as a hero, and a grateful Sri Lankan cricketer gave him his team shirt.